Carts have been around since the invention of the wheel, but the first golf cart dates to 1946. The pull cart was invented in 1945 by Bruce Williamson from Portland, Oregon, and the Jarman-William Company went into production in 1947. That original company is now called Bag Boy. When someone finally realized it was easier to push a golf cart than pull it, Bag Boy began to dominate the market. Other major companies emerged, such as Clicgear, Caddy Tek, Sun Mountain, the Bat Caddy and Spitzer. Push cart sales outnumber carry bags by five to one. As golfers age, they make a transformation from a carry cart to a push cart. Regardless of what type on golf cart you choose, there are certain features took look for. Keep in mind that many of these add-ons are optional and cost extra. A console that hold balls, tees, score card, cell phone, umbrella tube, range finder, beverage holder, towel/glove hooks and even a seat. Warranty of three years that covers manufacturing defects. After comparing numerous push carts, I felt the three wheel Clicgear 3.5 + and the 8.0 four wheel models stood out. These carts look solid, roll easily, are stable and can carry the larger new bags. A full bag rides high, with the club heads well away from the handle. The 8.0 model is like a tank on four wheels and has all the above features. In addition, the cart also has dual front wheel alignment, an oversize console, comes in multiple colors, has dual hand brakes and folds down into a small 15 x 27 x17 inch package to easily fit into the car truck. Either cart is a good buy. 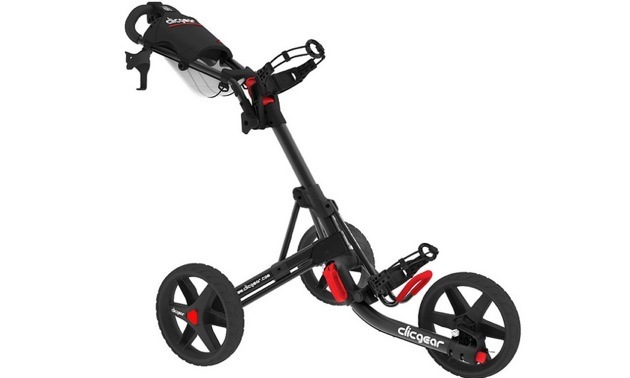 Clicgear push carts are available at Golf Town for approximately $230.